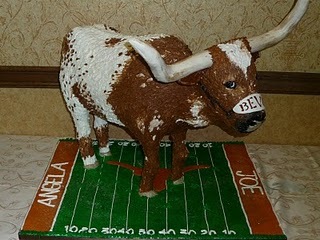 There have been many kinds of groom’s cakes to honor the University of Texas, most of them simple flat cakes with a longhorn on them. But the three-dimensional cake is pretty impressive! You expect it to "Moo!" I had seen several such cakes, and had been scratching my head wondering how they are made, and how much of the statuary is truly edible. “Let Them Eat Cake, Inc.” tells how this one was made on their blog. Enjoy! This entry was posted on January 9, 2011 at 3:58 pm and is filed under College Traditions, Let them eat cake!, Weddings!. You can follow any responses to this entry through the RSS 2.0 feed. You can leave a response, or trackback from your own site.